MILAN, Italy/ELLENTON, Fla., (Oct. 18, 2018) – Milestone, one of the leading racing game developers in the world, and Feld Entertainment, Inc., the worldwide leader in producing and presenting live touring family entertainment and motor sports events, are proud to announce Monster Energy Supercross – The Official Videogame 2. In this new release, globally available on Feb. 8, 2019 for PlayStation®4, Xbox One, Windows PC®/STEAM and Nintendo Switch™, players will step into the boots of an official Supercross Champion and experience the exciting life of a professional athlete in the most competitive and highest profile off-road motorcycle racing championship in the world. A new “career” mode. To become a real professional racer, being fast on the track is not enough, you must increase your fame and conquer fans’ hearts to attract the biggest sponsors while managing media relations and rivalries with other racers. New features include an agenda full of events and activities to improve your racing skills on four new tracks. The life of a real Supercross Champion isn’t just at the races! Your face, your style, your track. Every rider has their own style, both on and off the track. That’s why customization reaches a new level in Monster Energy Supercross – The Official Videogame 2. Players will be able to make their racer unique, thanks to more than 3,000 customizable items, from physical appearance to the long list of accessories to wear during races. On the track, there’s more than 300 customizable mechanical parts to always find the right feeling with the bike. The highly-appreciated Track Editor returns, enhanced with a lot of new features for players to create their own track to challenge and share online with the community. A new gameplay experience. The development team worked hard to deliver a more realistic and accessible gameplay experience. Thanks to the new Advanced Inertial Response and Real Terrain Collision technologies, bike control is now more accurate and realistic, both on track and in the aerial phase. Moreover, the new Dynamic Flow Aid helps players to always find the ideal trajectory to jump and land. “We are excited for the second edition of Monster Energy Supercross – The Official Videogame 2,” said Vicki Silver, Chief Marketing Officer for Feld Entertainment. “The Milestone partnership entered us into the video game business as part of an ambitious strategy to evolve both the sport and fandom of Supercross across the world. Expanding our digital footprint onto platforms where much of our audience is already spending their time, like gaming, allows our fans to dive into the highly immersive and realistic experience of the world’s most competitive and high-profile motorcycle championship. 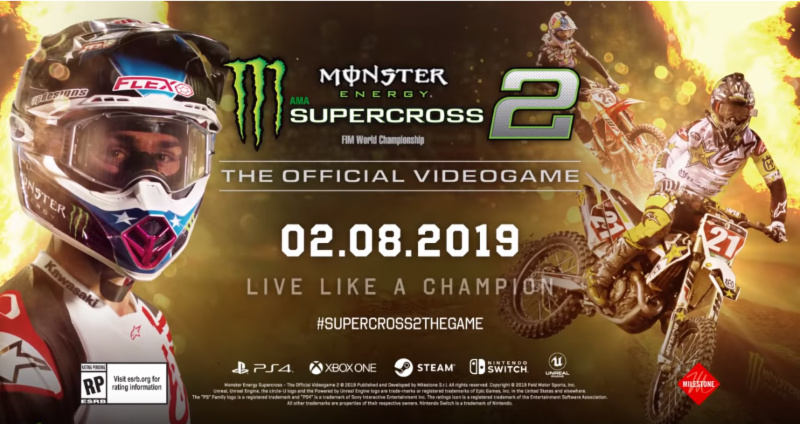 Monster Energy Supercross – The Official Videogame 2 will be available Feb. 8, 2019 on PlayStation®4, Xbox One, Windows PC®/STEAM and Nintendo Switch™.